Finnmarklopet 550 km / 2016 Best PB team. Finnmarkslopet 1000 in 2017. Works mostly in swing or lead. 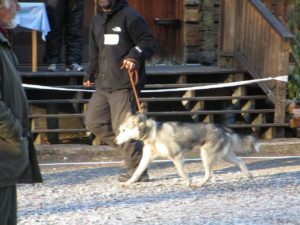 Ravn is living and working at Noatak kennel Sweden. 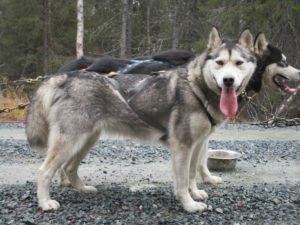 1 male and 1 female stay at our kennel. 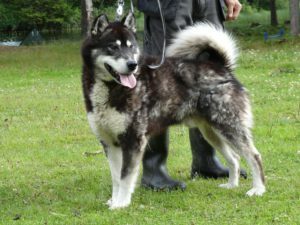 All others found a home at other Alaskan Malamute kennels and/or mushers around Europe. Health results, working results and eventually show results will follow as soon as they appear. BtW High Spirit Ravn: Callname: Ravn. 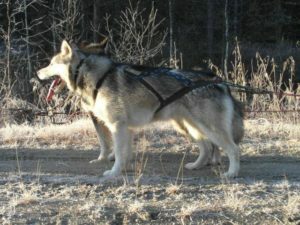 If you think about a high energy dog, than Ravn definatly is, so High Spirit Ravn is a pretty correct choosen name for him. In the dogyard he lives with 4 other males 24/7 and never create problems even though he is loud, pushy and tough he avoid confrontations. If I would have just 1 word to discribe him , than that would be ‘ impressive’. 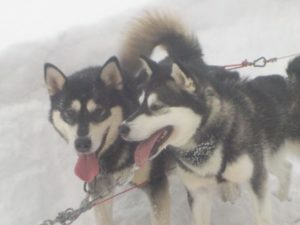 Knutte is pretty much the same type of energy dog as her brother Ravn. Also her social behaviour is similar, tough, pushy but avoiding confrontations at the end. She also runs in swing possition mostly, sometimes in lead. In the dogyard she lives with 2 other females. She’s an excellent trotter, in speeds between 7 and 15 km/hour. In the long run her speed is about 10-12 km/hour. Knutte is about 57 cm tall and 27 kg. 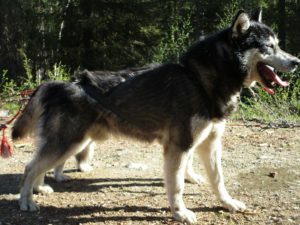 Good proportions and angulation and a bit lighter build malamute female. – 1949 trainings kilometers in season 2018-2019 and selected for the Finnmarkslopet racing team.